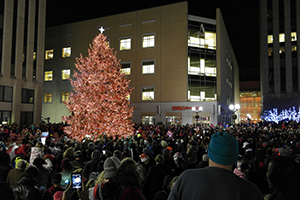 Friday November 23rd @ 7:45 p.m.
Watch the holidays light up during Dayton’s traditional tree lighting. At 7:45 p.m., we’ll throw the switch and approximately 50,000 colored lights will brighten the three-story-tall tree on Courthouse Square. Big 106.6 is a proud media sponsor for The Grande Illumination!